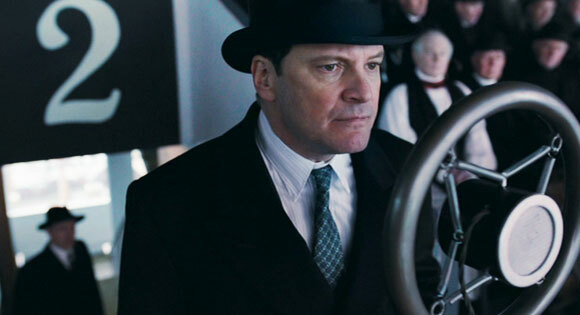 Colin Firth delivers his finest performance as the George VI, King of the United Kingdom. He deservedly won the Academy Award for Best Actor in director Tom Hooper’s brilliant The King’s Speech. “The nation awaits”, says the poster of Tom Hooper’s The King’s Speech. It is September 1939. The United Kingdom has issued Germany with a warning. The Nazi regime must withdraw its troops from Poland or a state of war would exist between the two countries. The deadline for Germany passes. World War II has officially begun. The nation tunes it wirelesses into the royal broadcast, waiting expectantly for its king to announce the news and to prepare his country for the long road ahead. 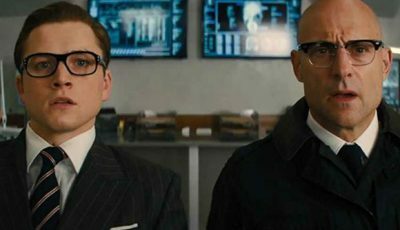 But King George VI (Colin Firth), only recently given the throne after the abdication of his brother King Edward VIII (Guy Pearce), has a problem. Since childhood he has suffered from a debilitating stammer, seriously undermining his ability to speak in public. Now, in his country’s hour of need, he must battle his affliction and deliver the king’s speech. Hooper’s film is essentially a tale of one man’s battle over adversity. Of course, it is one that comes with the inherited luxury of being born within the royal family. But the director dutifully juxtaposes the would-be king’s grandiose accommodation with speech therapist Lionel Logue’s (Geoffrey Rush) meagre London townhouse. But unlike Stephen Frears’ The Queen where George VI’s daughter has to battle with the dilemma of what to instruct her servants to feed the corgi’s, Hooper’s film presents the monarchy as it should be: flawed and out of date. Witness King Edward VIII’s unceremonious abdication following the marriage to the one he loves. The woman’s two divorces mean he cannot remain king. This is made even more damning since he is either unwilling or unable to produce an heir to the throne. The government, led by Neville Chamberlain, has also lost confidence in his wayward abilities. This means his younger brother must take charge, a task King George, or Bertie to his family, wasn’t expecting. Wife Elizabeth (Helena Bonham Carter) is desperate to help her husband overcome his problem. Her plight occurs long before she learns he is to take the throne. Bertie has tried many therapies including some amusing early 20th century remedies such as overloading the mouth with marbles and trying to speak, or being encouraged to smoke cigarettes because they relax the larynx, calm the nerves and make you more confident. Elizabeth eventually finds Australian speech therapist Lionel Logue who agrees to take her husband on only if his therapy is carried out in his own consultation room and not, as Elizabeth requests, at their royal home. It makes for an interesting dynamic between the classes – the prince and the pauper. And it allows the audience to see these two characters without pretence. Hooper is especially adept at not allowing the privileged to overstep the mark. This certainly isn’t a film celebrating the British monarchy. Indeed, its prestige is presented as nothing more than a very powerful public relations tool; a puppet whose strings are pulled by the government and the church. Moreover, Lionel is at pains to treat the prince as just another patient, insisting on calling him Bertie, the name only his family uses. There is therefore a universally appealing journey for the character to go on without the distractions of his status. Yet, Hooper amusingly plays on this for humour. There’s a lovely moment when an early silence between the newly acquainted Lionel and Bertie is broken by the speech therapist saying he believed it was polite to wait for a person of royal heritage to speak first. Bertie struggles with his reply, eventually saying: “Waiting for me to commence a conversation, one can wait rather a long wait.” There’s also a funny scene when Bertie, who has now been crowned King George, is at Lionel’s house with Elizabeth and Lionel’s wife comes home. The wife has no clue Lionel has been treating the king, making for an interesting reaction to the people she finds in her living room. But what really sets The King’s Speech apart is the performance of Colin Firth. No longer is he the wet fish holding Bridget Jones’ hand. Here he is understated, presenting King George VI as a passionate if self-defeating man with graceful ease. Firth has no trouble making his plight an authentic struggle to ultimately find this man’s voice. The king’s debilitating stammer is delivered by an actor who could only have achieved this level of accuracy through painstaking hours of research and long nights honing its staging. This is easily Firth’s best performance. 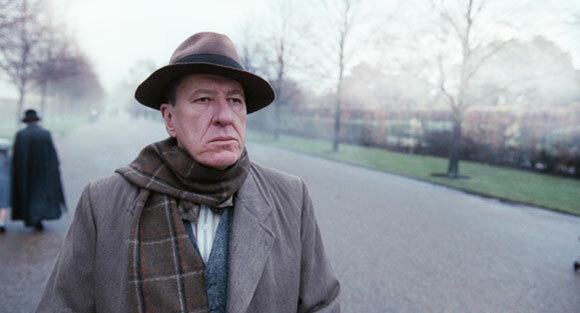 But the performances of the support cast should not be underestimated, particularly the brilliant Geoffrey Rush who is no less accomplished in The King’s Speech. Helena Bonham-Carter is also excellent as are Guy Pearce, Michael Gambon (as King George V) and Timothy Spall (as Winston Churchill). The film also benefits from its wonderful production design and Hooper’s brilliant ability to capture it. The ugly marble motif of Lionel’s office walls, with its discouraging earthy greens and rusty browns, striking a succinct balance between the opulent red velvets and gold coloured gold of the king’s residence. I particularly like the way in which Hooper captures it. 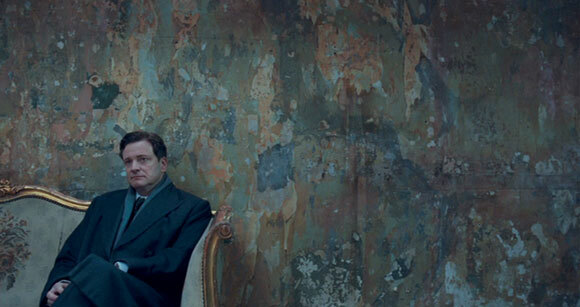 The director’s off-centre framing has Firth in one corner of the screen while the wall, which has more in common with the grime of the wooden floor, represents eighty percent of the image. It’s a great way to introduce us to these two very different men while highlighting the exemplary work of the production team. Indeed, throughout The King’s Speech it is easy for the mind to wander off as the frame is filled with so many wonderful interior and exterior locations. 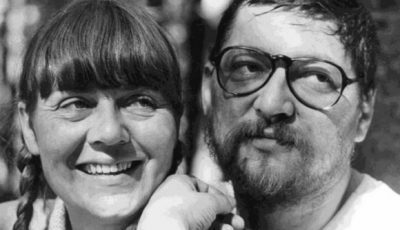 And Hooper is not shy of stylistic expression – his awkward framing of Bertie and Lionel’s uncomfortable first meeting is just one example, while later the director has the camera slowly track in and out, like lungs inhaling and exhaling, on a scene where Lionel is teaching Bertie breathing exercises. It is a sign of a director in tune with the technical ability of his craft and the story he is telling. The King’s Speech is an inspirational story about one man’s battle to overcome his affliction. It is also about a burgeoning friendship that transcends the classes and demystifies the British monarchy. It is powerful, dramatic, emotionally captivating and life-affirming in its inspirational recollection of a true story. 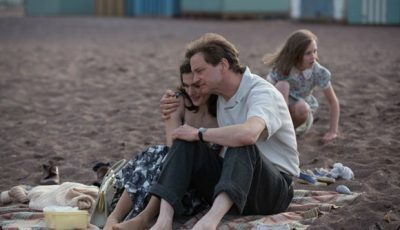 Tom Hooper’s accomplished direction deservedly won him the Academy Award, while Colin Firth delivers the performance of his life. What a great review Dan, Thanks for sharing. You have a wicked way with words. I have never seen this film, which is a bit of a shocker hey? I have it at home but have never got around to seeing it!!!! I am a bad boy! It is great to see a British film receive such a warm reception all over the world. It is an inspirational tale and has two great performances. See as soon as you can, Scott. I loved the film and was more than happy when it managed to beat all the dark crap this year at the Oscars. I also loved the inspirational and refined aspect of the film and the marvelous performances from the cast. I can’t wait to see some new films from Hooper especially since I also loved his mini series on Elizabeth 1st! Oooh, how timely! 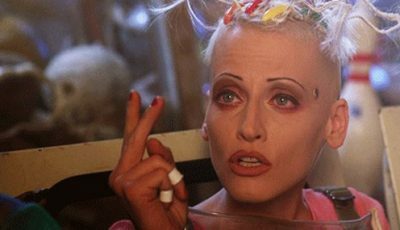 I just rewatched this over the weekend as my hubby hadn’t seen it. I still love it the second time around and I was actually more enamored by Rush’s performance though Firth is definitely excellent as well. I was rooting for this to win Best Picture so I’m definitely glad it did, usually I disagree w/ Academy’s choices so it was a refreshing change. Great review, Dan. I agree with Scott, you have a lovely way of writing. The King’s Speech has to be one of my favourite films of the last couple years. There’s nothing that I don’t like about it. 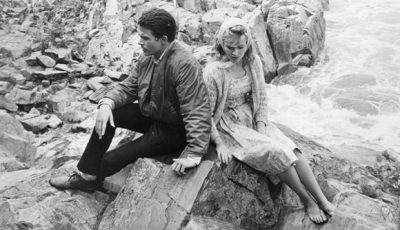 It’s a tender film, which was shot and acted superbly. Well-written review Dan, I liked The King’s Speech although I wasn’t quite enamored enough to think it was worthy of an Oscar. Both Rush and Firth are indeed excellent and the relationship between their two characters is a joy to watch. http://thomas4cinema.wordpress.com/2011/02/09/the-kings-speech-tom-hooper-2010/) Looking back today, I might have better memories of it, but not to the point where I could imagine watching it again anytime soon. Some excellent performances, however, and definitely worth checking out! Well written, as usual, Dan. 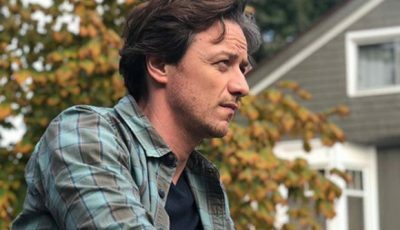 I think with every film that is lavished with praise by awards and critics will come under some scrutiny given high expectations. I had high expectations going into The King’s Speech but they were tempered somewhat by the fact I’m not a fan of films about the monarchy. I hated The Queen, for example. But The King’s Speech was both riveting and well made with two outstanding performances. I felt, like many others, it deserved all the plaudits it has received. It was also great to see British film continue its upward spiral. Such a great performance from Firth. He was outstanding in A Single Man, but the win for King’s Speech definitely took the edge off.